Introduction; Part I. The Process and Practice of Everyday Journalism: 1. 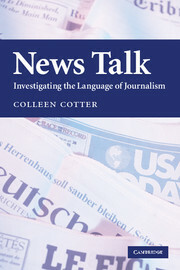 An interactional and ethnographic approach to news media language; 2. Craft and community: reading the ways of journalists; 3. The ways reporters learn to report and editors learn to edit; Part II. Conceptualizing the News: 4. News values and their significance in text and practice; 5. The 'story meeting': deciding what's fit to print; 6. The interaction-based nature of journalism; Part III. Constructing the Story: Texts and Contexts: 7. Story design and the dictates of the 'lead'; 8. 'Boilerplate': simplifying stories, anchoring text, altering meaning; 9. Style and standardization in news language; Part IV. Decoding the Discourse: 10. The impact of the news process on media discourse; Conclusion and key points; Appendix 1. Story samples; Appendix 2. Outline guide for the analysis of news media language; Appendix 3. SPJ ethics code; Glossary of news and linguistic terms; References.